Making candied rose petals is quick and easy – just follow my simple steps and you will have sweet, crisp rose petals to add to your cakes, bakes and puddings in no time at all! The first time I tried to make candied rose petals it really didn’t go to plan. The first petals became soggy as a result of too much egg whites. The second batch were perfect but soon came under attack from the steam created by Jon brewing in the next room (your average bank holiday weekend…) But, fortunately for me and after a bit of trial and error I finally had third time lucky. For all intents and purposes, crystallising rose petals is actually quite simple. 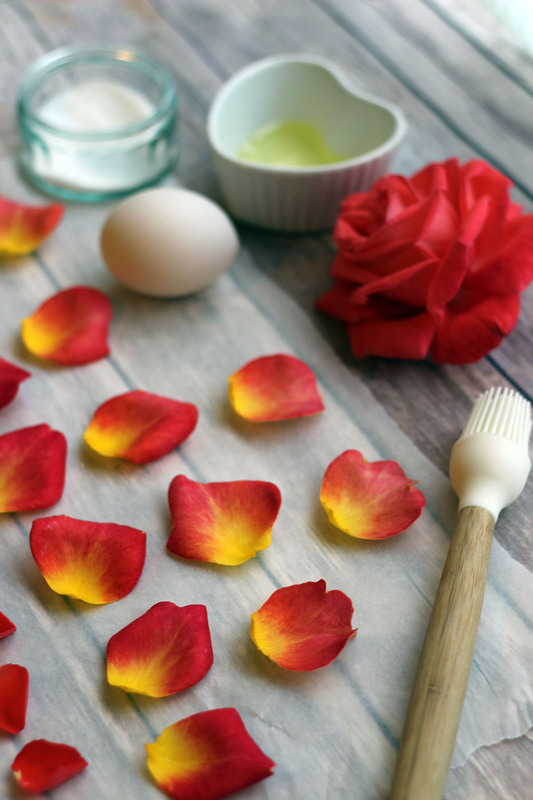 You need just three ingredients: (1) rose petals, (2) egg white, and (3) sugar. Plus, there is no requirement for any fancy equipment (just a pastry brush or clean paint brush). The key to perfect candied rose petals is much more dependant on the humidity in the air around you. If you’re suffering from a humid day I hate to say this but there’s no point even trying. The second you put those rose petals in a humid environment they will become soggy, limp and not pleasant at all. You certainly won’t want to top a cake or other dish with them! So why go to all the hassle? Well…these candied rose petals were the PERFECT addition to one of my favourite cakes – Cardamom Cake with White Chocolate and Rose Buttercream. But they are tasty little morsels in their own right! Each petal is perfumey, and sweet. The crisp sugar gives them a pleasant snap too. Once you’ve tried candied rose petals you will want to use them on all of your desserts. Why not try them on top of rose flavoured chocolates, turkish delight or even rose jelly?! Carefully remove each petal from the head of your roses and lay out on to kitchen paper removing any moisture from the rose petals. Gently whisk the egg white to make sure it's not gloopy or stringy. Brush each petal with a very small amount of egg white and sprinkle with some sugar. Repeat this on each side of the rose petals. Place each petal on to a wire wrack. Turn your oven on low (gas mark 1 or 80C), thenwith the oven door open, rest the wire wrack in front of the oven. Let the petals dry out in front of the oven for an hour turning periodically. Once the petals are completely crisp and dry store in an air tight container until immediately before use. The best rose petals are those which have no blemishes, are relatively flat and large. Ensuring there is no moisture on the roses is essential. Make sure they are completely dry before you begin. If you don't want to leave your oven on for an hour, you can leave the petals to dry overnight. So there you have it! What looks like an incredibly professional finish to your cakes and desserts is actually incredibly simple when you know how! 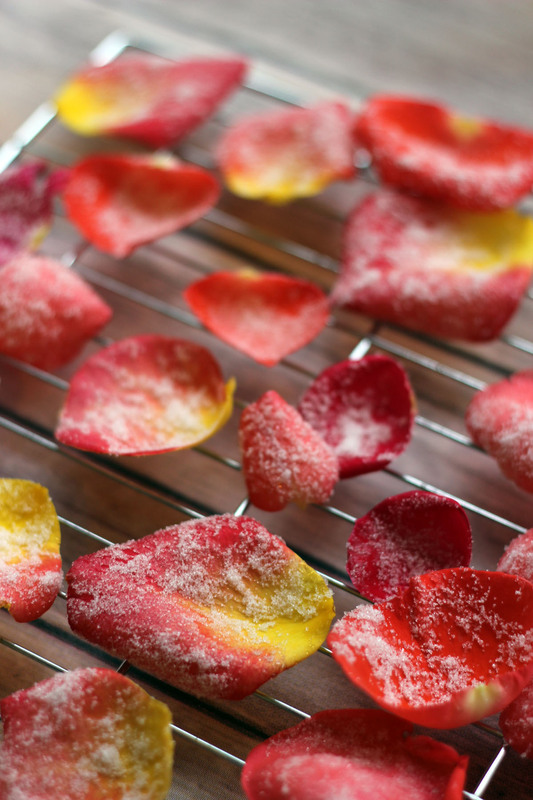 If you make these candied rose petals I’d love to see photos of your finished bakes! You can tweet me @KitchenGoddess3 or send them to the Supper in the Suburbs Facebook page. These are so pretty! I think wild roses would make for a superb cake topping – I must try this! What pretty petals. I haven’t made any of these in far too long, but it will have until next year now as our rose has given up for the year. This method works really well for primroses and violas too, which is great for the spring. Great suggestion Choclette! I will definitely try with other petals. I know Jo! So pretty yet so simple! Would love to see your finished petals. They look lovely! Will have to try! How long would they keep – or do you have to use them immediately? Hi Hannah! If stored in an airtight container, and the rose petals are indeed completely dry, then the rose petals can in theory be kept for up to a year! I’ve never kept them this long though as they are too pretty. I often use the within a couple of months. Very pretty indeed. Used this method to top some fondant fancies recently and it was a very effective final touch. They sound wonderful Emily. Fondant fancies are my favourite!!! How perfect. The fact that homemade allows you to pick the perfect shade to suit your requirements is an added bonus. I have a Turkish Delight layer cake that these would be perfect for and now I’m kicking myself for using (very expensive) shop bought. Thanks for your tips on when not to even try making them. I’ve never heard of this before…but am COMPLETELY intrigued! I must try it ASAP! Thanks so much for sharing this!! Such a cool idea! These would be such a gorgeous garnish! Lovely! I love cooking with rose though I never tried candied rose petals. We usually use gulkand which is a sweet rose petal preserve for desserts.. I can’t say I’m familiar with gulkand! I’ll have to investigate!